People suffering from asthma and chronic obstructive pulmonary disease have been taking help from cfcs (chlorofluorocarbons), an ozone-depleting chemical, to breathe easier. cfc is used as a delivery agent, or propellant, in inhalers. But an international agreement signed in 1987 makes it mandatory to stop using cfc after January 2010. The clock is ticking fast for companies making inhalers, while an estimated 500 million people suffer from respiratory diseases worldwide. Since the Montreal Protocol on Substances That Deplete the Ozone Layer was signed, researchers across the world have assessed 15,000 chemicals to replace cfcs. They found two types of hfa (hydrofluoroalkane) met the requirements of propellants used in inhalers. The protocol has provisions to allow cfc in essential products like inhalers till 2012 but a country needs permission to use them. India has applied to the unep. It is likely to get permission for using 340 tonnes of cfc per year. This is half the amount the country uses in inhalers. To ensure that India meets the deadline in a way that patients do not suffer, the Union ministry of health and family welfare held a workshop in Delhi on October 5. Industry representatives and policy makers discussed two aspects ways to help industry shift to non- cfc inhalers and increasing awareness about them among doctors and consumersnon- cfc inhalers require more care and cleaning. Not all patients can afford cfc inhalers. The preventive ones taken every day cost between Rs 200 and Rs 450. hfa inhalers will cost about 30 per cent more. 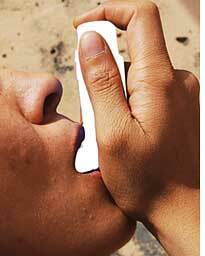 Besides, hfa inhalers use alcohol to dissolve the medicine, and alcohol can trigger an asthma attack. Though the technology for hfa -based inhalers has been available since mid-1990s, even developed countries are yet to make a complete transition to them. In the US, cfc - free inhalers have been available since December 31, 2008. The National Campaign to Save cfc Asthma Inhalers in the country says non- cfc inhalers do not deliver the medicine with enough force to reach the lungs. The campaign contends companies did not test hfa propellants on people suffering from respiratory problems before introducing them in the market. A study in the UK published in the British Medical Journal in 1998 showed that more patients using hfa inhalers stopped taking the medication because of adverse effects. The campaign demands that cfc inhalers be continued in the US because the amount of chemical needed is very small. No one has quantified environmental and health benefits from banning cfc in inhalers. The medical community in India, however, sounds more sanguine about hfa inhalers. Efficacy of an hfa -based inhaler is the same as that of a cfc -based inhaler. Once you tell patients that the product is safer for the environment, they agree, said A S Vasudev, senior consultant paediatrician at Apollo Indraprastha Hospital in New Delhi. All of Vasudevs patients use hfa inhalers. The Indian industry is worried about the price because an hfa -based inhaler requires different components, cans and valves. While the ones for cfc inhalers were made in India, they will now have to be imported. The technology to make them is patented. Generic makers need to find suitable options. This would require studies on pressure and drug solubility. This takes a long time, especially in case of combination drugs, said Ameet Sule, who looks after aerosol development at Cipla Ltd in Mumbai. Even production in India will not make much difference to the price because the manufacturing process is automated and cheap labour is unlikely to make a difference. At the October meeting industry suggested exempting valves, cans and hfa from customs duty for the transition period. Alcohol used in hfa inhalers also invites higher excise duty, said R C Potnis, head (technical development) of Midas-Care Pharmaceuticals Pvt Ltd in Mumbai. The health ministry has chosen five companies to help India phase out cfc in inhalers (see Breathing HFA). These companies will get help in technology transfer, monitoring and assessment from undp and unep. Surinder Singh, Drugs Controller General of India, contends that when the volumes go up, prices will come down.